On December 26, Dennis Brutus, world-renowned South African poet and anti-Apartheid fighter, who spent time in Robben Island prison with Nelson Mandela, died at the age of 85. 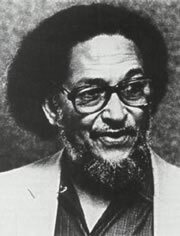 Early in this decade, when he was a professor in the Black Studies Department at the University of Pittsburgh, Dennis Brutus and I were attending the same political conference in that city. We had never met. I approached him, somewhat hesitantly, to share a poem I had written referencing the struggle in South Africa. He read it immediately, and eagerly. Then, to my surprise, he began a conversation as if we were long-time comrades and collaborators. That, in my experience, was Dennis Brutus summed up: a man who had achieved greatness by any ordinary standard. But the esteem in which he was held by others seemed unimportant to him. He felt, and acted, like an ordinary human being simply doing what needs to be done. He treated others, even strangers, as if that were true as well. Over the next few years, every time our paths crossed—mostly on his frequent visits to New York City—Dennis would ask me what poetry event was being organized that he might participate in. It was, in part, as a result of his urging that I organized the very first “Activist Poets’ Roundtable” at the US Social Forum in Atlanta in 2007. He also helped launch the Roundtable in New York City in March 2008, after the annual “Left Forum” where Dennis appeared on several panels. It was at this time that I really got to know him well. He had injured his foot, somehow, on the eve of the Left Forum and was having difficulty walking. I spent that weekend driving him back and forth between his hotel and the conference site, also making sure he had the help he needed getting around at the conference itself (and in his hotel). Then, when his foot did not improve, he accepted an offer of a place to stay for a few days in Brooklyn, where he wouldn’t have to manage on his own. He and I spent a lot of time together during those few days, in particular waiting for medical attention at the Kings County Hospital emergency room. And he told me stories about his life in the struggle against Apartheid. I will never forget the chuckle in his voice as he talked about the time he was shot in the back while attempting to escape from the police. He could laugh, too, about the absurdity of breaking rocks at Robben Island prison, the lengths to which the Apartheid regime had gone to suppress dissent. And yet it was all for naught (the source, I assume, of his mirth). The regime could not survive, no matter what brutal measures it resorted to. The people of South Africa were too strong. During this entire time, as his foot at first got worse then gradually began to feel better, the biggest concern he expressed to me was that he shouldn’t become too much of a burden. In that same month we drove together to Washington, DC, for the first “Split This Rock” poetry festival. Dennis found it impossible to attend such an event without making it an opportunity for a little political organizing. He decided, on the way down, that we should use the festival as the occasion for a declaration of poets calling for peace and social justice in the world. And so an “Appeal to Poets, Writers, and All Creative Artists” from the festival, for actions in March 2009 which would “Speak Art to Power,” was born. In the end it was signed by a majority of those in attendance at the festival. The overwhelming majority of young activists in the struggle for a better world believe that they are committed for life. Very few, however, actually fulfill this promise which they make to themselves. How many who were Dennis Brutus’s comrades in the anti-Apartheid struggle, for example, ended up compromising their commitment to human liberation once the overthrow of Apartheid was achieved and power transferred into their hands? Dennis, however, remained committed to the poor and oppressed of South Africa and of the world until his final days. He was constitutionally incapable of doing otherwise. It has always struck me as one of the sad ironies of our existence that we can never, truly, count anyone in the ranks of the very special few who fulfill their youthful pledge—to themselves and to their own humanity—until they are no longer with us. Dennis fulfilled his pledge. He is no longer with us. The world will miss him. I will miss him, too.